I’d never knock Rolex. It’s a good brand. They make great watches. Mr. Bond wears them. They’re the only watch company in Geneva that makes all components, cases and movements in-house (that’s why they’re so darned expensive). The only grouse I have about this luxury watchmaking behemoth is that tiny fib about turning down the Zenith El Primero frequency to “increase” reliability- but that’s another story. Today, I want to introduce you to this retrotastic men’s watch: Citizen 7 Diver. Featuring a 21 jewel in-house automatic Citizen movement, the 1990s release though labeled “Diver” is only capable of depths of up to 100m (most regular Rolex wearers don’t even dive that deep or bring in near water). It follows similar aesthetic to the Rolex Submariner, with deep set black dial, quick set date window and date magnifier. This Citizen 7 Diver watch has an added design accent which I thoroughly enjoy- red second hand. The Citizen 7 diver on left also replicates the "Jubilee" band famous on many retro-Rolexes circa 1970s. New Submariners have the usual steel bracelet as seen on the right. Admittedly, the table over simplifies things a little: In terms of movement and case finishing, the Submariner is much MUCH better decorated and polished. 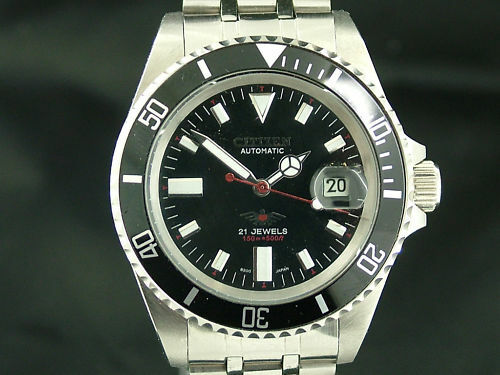 However, you are saving over USD5900 for the Citizen 7 Diver. Citizen and Seiko designed the working man’s automatic movements and as such- you get the working man’s price tag without any of the serious refinement that goes into a men’s luxury watch. In terms of aesthetics, the Citizen 7 is no lightweight to the Rolex, consider getting it if you don’t want to spend serious money on a timepiece- No one will notice it’s not a Rolex (it’s a psychological thing) and best of all, it’s not some cheap knock off that will die on you in two weeks- It’s luxe for less. The Citizen 7 diver on left also replicates the “Jubilee” band famous on many retro-Rolexes circa 1970s. New Submariners have the usual steel bracelet as seen on the right. ← Lunch in Style: The No. 215 bag from Artifact Bag Co.
Deal. Getting one right now. Hey Eeps, you serious? Want me to book for you? Looks like a great watch but a Google search reveals no source to purchase. Problem is, it’s a white dial (not the classic Submariner look) and the bezel is different. Chances are, it’s out of stock but there’s one retailer on eBay who puts his new old stock up every now and then. I’ll help keep a look out 🙂 Till then, good hunting! I own this watch and am desperately seeking a local, reputable, watch repairer in Houston TX to service it. Any suggestions? I have purchased this watch from http://www.retro-watches.co.uk. Paid £83.00 and never received the item.I had to open a PayPal dispute to get my money back.Seller provides tracking number then claim insurance for items he never sends. Be warn.You will be scam. These are nearly impossible to find. It’s easier now to get an Orient Mako, Invicta 8926, or Seiko “Sea Urchin”. All will give you a look similar to the Citizen. DO WANT! The perfect beater so my real Sub can stay safe in the…safe! The problem is the Eagle-7s were discontinued in the late 1990s/early 2ks. None of those suggested alternatives really offer the level of quality the Citizen does. I know because I have two of the three and while I don’t hav this Citizen ‘Sub’, I have other Eagle-7s and they are fantastic value-for-money. The Sea Urchin (have) has a plastic bezel insert and dial, a display back (yuck!…why?) and cheap-looking case. Rattly oversized Oyster bracelet. Decent lume though. 7s36 mov’t doesn’t hack or handwind. Don’t really know why I bought it, it gets zero wrist time. The Invicta (have) is a bit more refined–nice case, if you don’t mind the incredibly tacky ‘Invicta’ stamped on the side–and on every link of the bracelet. The latter btw, is decent. Display back too, but at least the mov’t rotor is a bit ‘decorated’. Still, not thrilled with display backs on ‘dive’ watches (or their ostensible homages). Lume is pathetic. Seiko NH35-A mov’t hacks and handwinds (the mov’t is the best thing about the whole watch). The Orient has that stupid and totally unnecessary extra crown to set the day, which I despise and is the reason I don’t have this one. It’s just another potential failure point for those like me who DO swim or snorkel (serious diving not recommended). Don’t know anything more, was never inspired to look past the instant turn-off of that stupid extra crown. This Citizen is just more “polished”. It has a beautiful, refined dial with the shiny metallic Eagle-7 logo and sharp-edged rectangular applied markers which are cool and fitting yet not too much like a blatant copy. The case shape hits the sweet spot too, with graceful lug horns, and it has a solid back. 8200 mov’t handwinds (but no hack). They are more accurate and refined than the 7sxx series and can be regulated to within COSC if not already so out of the box. Love the bezel. It’s just “right” without being a total bite-off. Dang! Guess I’ll have to keep looking amongst the little watch vendors with NOS, where I got my other Eagle-7s from. “Inb4” anyone says, “buy a replica”, I thought of that, but just can’t stomach it.